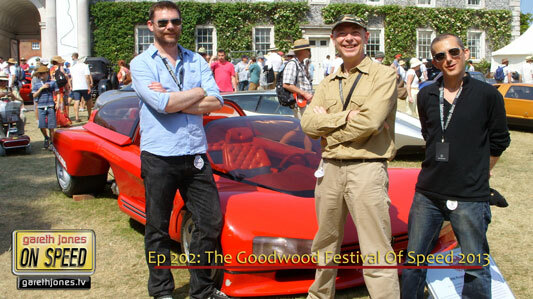 #202 Goodwood Festival of Speed 2013. We drool over new supercars and old concept cars, talk to Lord Drayson, and Nick Heidfeld and even ask Lewis Hamilton a question. Plus the sound of some of the most exciting machines going up Lord March’s hill. Here are the cars we looked at in the Cartier “Style e Luxe” display. Porsche 917, MTT Street Fighter, 2009 Ferrari F60, Mercedes Benz W2, Red Bull RB7, Caterham, Lotus- Renault R30, Maserati 250F, Lotus 79, BRM P57, Lotus Cosworth 72, Honda, Mercedes-Benz W196, Ferrari 312BB “Snakepit”, Sunbeam Indianapolis, Lotus 56 Gas Turbine, Audi R18Etron quattro, XJR-9, Toyota 030, Toyota GTOne, Alfa-Romeo 33tt3, McLaren MP4-12C, MP4-4.